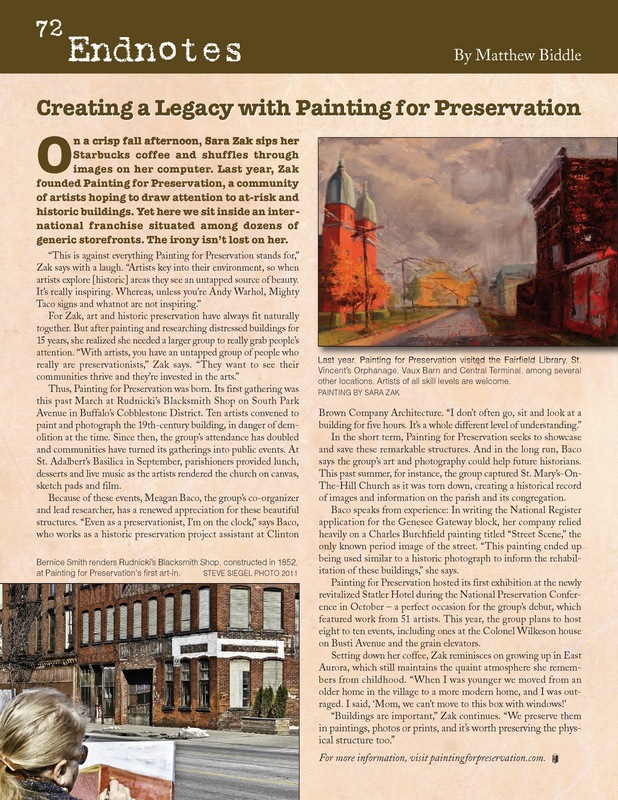 Painting for Preservation recently occupied the back page of WNY Heritage Magazine, our region's distinguished history and preservation periodical. Sara Zak and Meagan Baco were interviewed by new Junior Editor, Matthew Biddle, for their newly created "Endnotes" section, most definitely saving the best for last. Personally, I enjoy the quips and infographics that typically show up on the back pages of magazines, and I really enjoyed, "Creating a Legacy with Painting for Preservation." Some of the story is reproduced below, but we encourage you to purchase the Winter 2012 volume of WNY Heritage and/or subscribe for the whole year! Thank you to Matthew Biddle for the thoughtful interviews and great resulting story, and thanks Steve Siegel for donating a photograph for publication. One of Sara's paintings of Saint Adalbert Basilica and it's neighborhood was published, too.